The number of periodicals published in Turkey (including weekly publications) is 5,665. There are about 2,500 newspapers currently circulating in Turkey, including 55 national and 23 regional newspapers. National newspapers and broadcasting companies are based in Istanbul and Ankara. 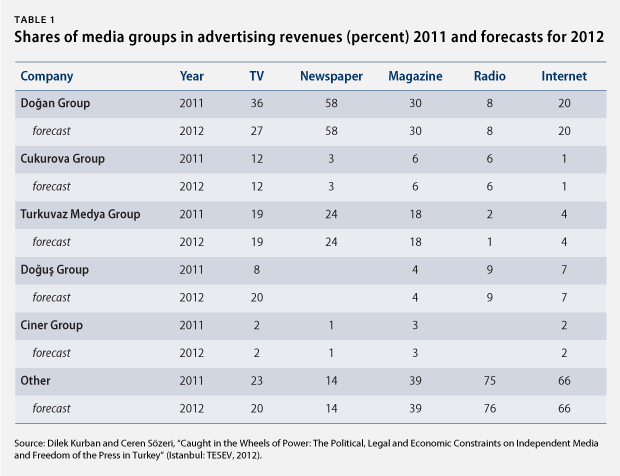 The control of the media is in the hands of large multi-sectoral groups - Doğan Media Group, Turkuvaz, Ciner Group, Çukurova Group, Doğuş Group, and Feza Group, while the distribution of the print media is controlled by Doğan Group’s Yay-Sat and Turkuvaz Group’s Turkuvaz Dağıtım Pazarlama. 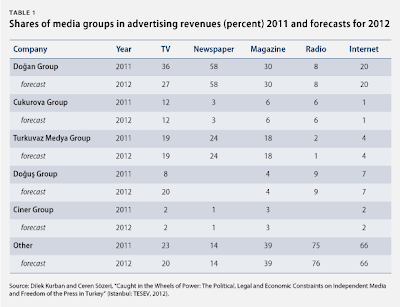 The leading newspapers (with respect to average sales) are Zaman, Posta, Hürriyet, Sabah, Sözcü and Habertürk. Although its power has declined, Doğan Media Group is the largest and the most prominent media giant in Turkey. Despite government pressures, it still controls a number of high-circulation newspapers - Hürriyet, Radikal, Posta, English-language Hürriyet Daily News, and Fanatik. Almost the entire remaining part of the media is owned by pro-AKP businesses and maintains a pro-government slant to curry favor with AKP. Turkuvaz Media Group is owned by Çalık Holding, and Prime Minister Erdoğan's son-in-law is the CEO of Çalık Holding.The newspapers owned by this group are Sabah, Takvim, Fotomaç and Yeni Asır. Ciner Group, the former owner of Sabah, launched Habertürk in 2009. Feza Group, which has close connections with the Islamic sect leader Fethullah Gülen, controls Zaman and English-language Today's Zaman. Albayrak business group owns Islamic-oriented Yeni Şafak. Other Islamic oriented papers are Yeni Akit and Milli Gazete. Taraf daily launched in 2007 by several prominent journalists and intellectuals is known as a critic of the army and is pro-Kurdish. Staunch Kemalists and nationalist status-quo groups in turn publish newspapers like Cumhuriyet, Sözcü, Yeni Çağ and Aydınlık. They are harsh critics of the government.